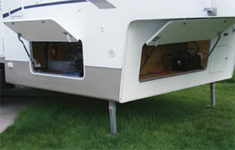 RVs are exposed to the extremes of weather. Our rigs hang out at the beach, bake in the sun and endure the rain and snow. Rust and corrosion are commonplace, and we want our RV to last a long time—right? 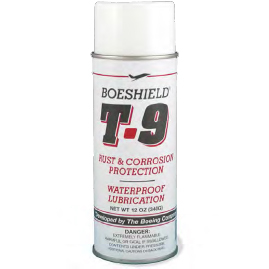 I’ve been using a product for many years that is just what RVers need: Boeshield T9®. This product is not your average lubricant. T-9 was developed by Boeing to provide long-term metal protection and lubrication. It penetrates crevices deeply, displaces moisture, dissolves minor corrosion and leaves a clean, waxy, waterproof film that won’t wash off in rain, puddles or mud. The dried film isn’t sticky, so it won’t attract dirt like other spray lubricants. Spray Boeshield T-9® on and wipe off the excess. 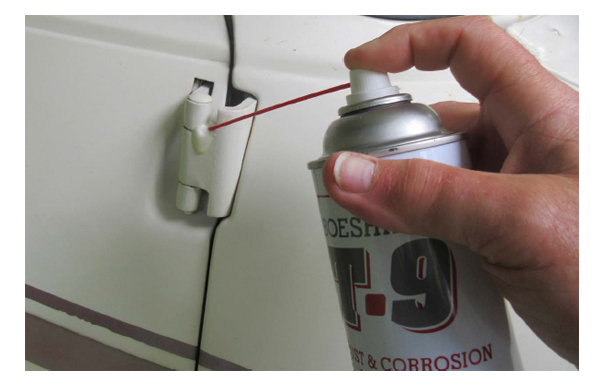 It won’t harm paint, plastic, rubber, fiberglass or vinyl, and it can be used on engines, wiring and belts. I use it on all areas of my RV, including door hinges, sliding window tracks, locks and latches, roof vent cranks, awning hardware and hitch parts. It even keeps my motorcycle chain from rusting! or corrosion protection. Boeshield® also offers a rust removal product, RustFree, that can be used to remove existing rust before applying T9. Prices range from $4 for a 1-oz. bottle, to $120 for a gallon. A 12-oz. spray can is under $20. Average Street Price: A 12-oz. spray can is under $20.